Today through September 30 you can #HelpKidsLiveBetter when you donate at your local Walmart or Sam’s Club. They money raised at local stores directly benefits Children’s of Alabama. 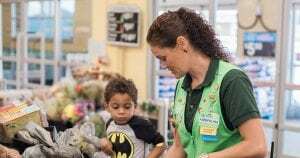 Since 1987 Walmart and Sam’s Club associates, customers and members have raised nearly $1 billion for their local Children’s Miracle Network Hospitals. Give today at your local to store to help them pass the $1 billion mark! Next post: Miracle Monday – Meet Savannah!